What does my guardian angel do in my day to day activities? The first reality that I want to awaken to you is: God in His infinite Mercy, and knowing of our constant weakness, He did not want to leave us alone and forsaken, and destined for each of His children when an Angel is born, whom we call Guardian Angel. 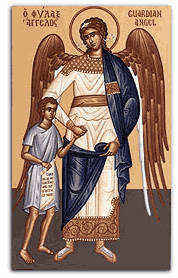 This Angel given to us has a mission of paramount importance, which is to take us to Eternity with God. For we know that each of us is born into eternity, but our life and God will say whether it will be an eternity with God, or an eternity without God! We run the risk of always associating the image of our Guardian Angel with those pictures in which we usually see painted “cute” angels, “colorful” and “fragile”. What a tremendous mistake we made when we transferred this image to our personal relationship with him, because we somehow believe that our Angel is not so strong and powerful.